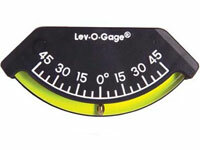 An inclinometer, also known as a clinometer or tilt meter, is an instrument for measuring angles of inclination. 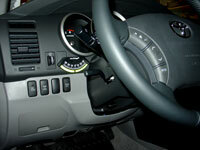 They measure the pitch and roll of a vehicle while driving off-road. 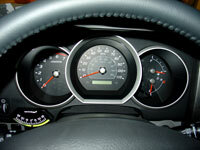 One inclinometer is mounted on the dashboard to the left of the steering wheel, measures side-to-side tilt angle. 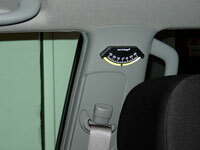 A second is mounted on the side pillar above the passenger seat belt anchor, shows angle of climb or down grade. The clinos are made by Sun Company, Inc. and are the Lev-o-gage model. They have has been manufacturing inclinometers since 1971. The markings are engraved and paint-filled, not screen printed. This makes for long life and easy readability.